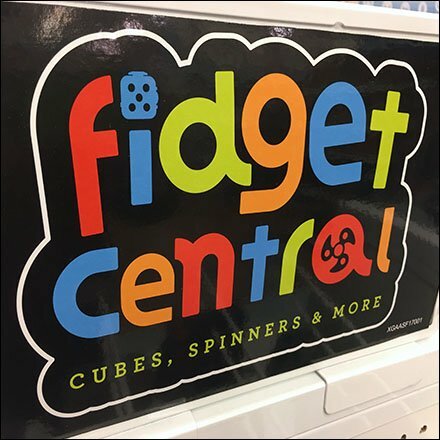 If your offerings and sales are significant, consider an upgrade to this Fidget Spinner Freestanding Island Display and category definition. Flip-Front Scan Hooks and Shelves face in all for directions for maximum merchandising effect. Componentry includes 1-Piece Straight Entry Scan Hooks for the tightest possible item placement and easy planogram revisions as new Fidget Spinners hit the marker. Central and PowerWing Wall Signage is slide-in again allowing change or upgrade. Also see that the Central Sign Holder is Saddle-Mount, again allowing change of the entire sign frame size. This Fidget Spinner Freestanding Island Display seen at Babies R Us, Scranton PA.